UNITED STATES: The Bureau of Ocean Energy Management (BOEM) will host an auction on 13 December for potential wind farm sites off Massachusetts. Nineteen companies have qualified to participate in bidding for part of a 1,580km2 lease area that BOEM said could support up to 4.1GW of wind capacity. Three development zones will be auctioned in the lease area. The area is comprised of the two development zones that failed to attract any bids in the first wind lease auction in the state in January 2015. In that auction, two other areas were leased. RES Americas agreed to pay $281,285 for a 759km2 parcel of the zone and OffshoreMW, part of Germany's WindMW, bid $166,886 a 675km2 zone. Shortly after the auction, Ørsted acquired the RES Americas zone and is now devoloping it as the Bay State Wind project. OffshoreMW, and its lease zone, was then acquired by Danish firm Copenhagen Infrastructure Partners (CIP). CIP is now developing the site as the 1GW Vineyward Wind project with Iberdrola subsidiary Avangrid Renewables. Under a 2016 law, Massachusetts requires its utilities to purchase power from 1.6GW of offshore wind capacity by 2027. 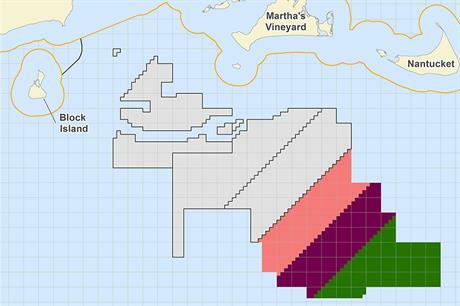 This comes as BOEM starts taking public comments for Deepwater Wind’s proposed 90MW South Fork project off Rhode Island. Deepwater was acquired by Ørsted in early October, although the transaction is yet to close. Deepwater’s CEO Jeff Grybowksi said: "Our timeline is right on schedule. We are on track to begin construction on the South Fork wind farm once the environmental impact statement and permits are in hand, by 2021, and to deliver clean energy to the South Fork starting in 2022." BOEM will also start taking comments on potential development areas within about 2,780km2 off northern and central California. Because of California’s deep waters, floating wind farms are most likely to be developed. "I'm very bullish on offshore wind, and harnessing this renewable resource is a big part of the Trump administration's ‘made in America’ energy strategy," said US interior secretary Ryan Zinke in a statement.